Why might an individual experience certain events and certain types of feelings at one location and not another? Why might some places make you feel energised and motivated, while others make you feel uncomfortable and seem to bring nothing but trouble? Why on earth wouldn't they? The location factor of our environment takes account of place, space and direction, and astrology is founded upon the principles that these reflect meaning, symbolic significance and tangible effects. The branch of astrology that recognises the shifting influences we encounter at differing locations is captured by the study of Astro*Carto*Graphy. Martin Davis, a widely aclaimed expert in this area, presents an introduction to its use. Most astrological work has a time-orientated perspective. Location is an ingredient of course, as longitude and latitude are necessary inputs, but the emphasis or desired information is on what and when an event or astrological 'hit' will transpire. The natal or event chart is itself of a moment in time from which we look for a potential unfolding (in time) using techniques such as transits, progressions and directions - all time-oriented techniques. The space factor hasn't played a very big role, and the space factor is really what Astro*Carto*Graphy is about. The late astrologer and author Jim Lewis developed the technique of A*C*G. The names of his teacher, Donald A. Bradley, and others such as Roy Firebrace, Dr Marc Edmund Jones and Gary Duncan figure in the original conceptualisation of the technique, but put simply, Jim did a magnificent job developing the tool to what it is today. Jim began his work on A*C*G in the 1970s, introducing it to the public in 1976. He completed a major part of it in 1982 when he launched Cyclo*Carto*Graphy (C*C*G), the mapping of one's transits and progressions. When we employ A*C*G, we connect the planetary influences directly to the earth upon which we live. Planetary energies are brought down to earth, so to speak - they are no longer an influence 'out there', but 'down here', right where we stand or to where we travel. The A*C*G technique helps us see what we can expect at certain locations or why people or things come to us from those locations. In fact, the A*C*G maps are views from beyond the planets, looking down upon the earth, showing where we can expect the maximum planetary influences to be felt. This means that when employing A*C*G maps, we use actual geographic maps of the earth (or of regions on the earth). 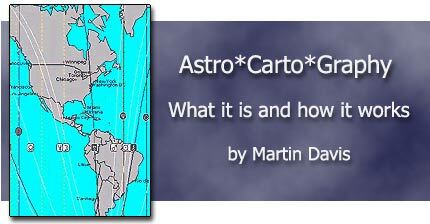 Astro*Carto*Graphy Maps: How do they work? A*C*G maps are tools to describe the effect of planetary angularity upon the earth for a given moment of time. The approach is based upon the well-noted effect that planets oriented to the earth in angularity pack the most power in terms of earthly consequences or events. Angular positions for planets are their rising, setting, high point (culminating), and low point (under foot or anti-culminating) placements. In its most condensed explanation, an A*C*G map is a diagram that shows, simultaneously, where the planets are angular at the moment under investigation. This simultaneity is the basis of the A*C*G map itself, which plots all the planets at once for their angular effects upon the earth. As Lewis himself said, 'I computer-generate a map on which lines are drawn that show where certain planets would occupy the spotlight of angularity'. We consider the A*C*G map to be an indicator of planetary angularity at the moment chosen for investigation. In this view the A*C*G map is a system in its own right, independent of any other techniques. Seeing A*C*G this way is most useful in mundane astrological work, where we want to look at angular planetary effects on a specific country, or geographic locations for charts of nations, world leaders or those of political events, eclipses, lunations or ingress moments. In working with personal charts (rather than political events, ingress moments, etc. ), it is helpful to consider the A*C*G map as an overview of where we would find planets on the angles of the relocated charts. It should be kept in mind that both viewpoints are correct, simultaneously, and students can interweave perspectives depending on the purpose of the map. What is a relocated chart? Prior to the development of A*C*G, astrologers had only one major technique to measure a client's relocation possibilities: the relocation chart. This chart is created by altering the natal co-ordinates of longitude and latitude to those of another location. Date and time remain while the locational information is changed. This gives us a picture of what the birth chart would have been like had the native been born at the place of relocation (at the same universal time). The planetary positions in zodiacal degrees remain the same as in the natal chart, but the angles (ascendant, descendant, MC and IC) and house cusps of the chart are changed, moving the planets to different positions within the wheel itself. In general, the movement of planets to angular positions in relocated charts is of greatest importance. A planet brought close to an angle can stand out from all the other chart factors and become a dominant theme in a person's life. For example, Venus moving to the Midheaven of a relocated chart, indicates that the individual might find a rush of friendly social activity at the new location, be able to create good relationships for business and perhaps, for the first time in their life, find opportunity in the entertainment industry, the arts, crafts or even in astrological relationship counselling! When we use the A*C*G map with personal relocation in mind, the map becomes a grand overview of all earth locations where we would have planets on the angles of our relocated charts. A*C*G is then no longer a tool completely in its own right but rather is used co-operatively with our relocated charts. We can expect to see at least 40 lines on an A*C*G map, since the ten planets are each represented by their four lines of angularity: Midheaven [MC], Imum Coeli [IC], Rising [ASC] and Setting [DSC]. Some maps may have more lines if Chiron, the Nodes, asteroids or even aspect lines to the angles are included. This is so regardless of which of the two perspectives of the technique we are using: planetary angularity in its own right, or as a grand relocation overview. In either case, with maps in hand, we can knowledgeably study or roam our 'global village', helped by an understanding of the type of influences and/or events that we can expect at its many different locations. Let's start with the natal A*C*G map of former UK Prime Minister Margaret Thatcher. We could use the map to uncover where she might enjoy a holiday (using it as a grand overview of angularity in her relocation charts), but, as a public figure and world-leader in her time, we can also use it as a mundane tool to better understand her participation in the events of her day. Planetary MC lines run vertically, straight up and down on the A*C*G map. In actuality each one is a curved meridian running from pole to pole, crossing the zenith or overhead position of its planet. When represented on a two-dimensial map, each curved MC meridian appears as a straight, vertical line and corresponds to a parallel of longitude. The force of a planet on its MC line will influence career, social milieu and environmental issues in an outer orientated, public and perhaps highly visible way. In mundane studies of countries we can see this planetary effect describing the government of the nation, including its 'ruling class', its traditional chieftains or wealthy elite. A planetary MC line through a country can also indicate issues of national prestige or how a nation is seen by its neighbours or would like to be seen. Jim Lewis felt that where you find a planetary MC meridian on an A*C*G map is where you are "socially classified by the planet's force". Each IC line is separated by 180 degrees of map longitude from its corresponding MC line. IC lines also run vertically, straight up and down on the A*C*G map and they too correspond to parallels of longitude. In actuality, they are the other side of great circles, running pole to pole around the earth. The side facing the planet itself becomes the MC line; the far side, the IC line. The IC line is where the force of the planet acts to centre or root individuals - perhaps bringing them into direct engagement with their origins and past. It can give insights into those issues necessary for an individual's integration and personal security. This line, perhaps more than any other, is about how we connect with a place. From the relocation perspective, this makes it an important angle. In mundane use, the force of a planet on this line will indicate the nature of the base of a society, especially its traditions or the ideologies of its people. IC planetary lines can also tell us about a nation's land and agriculture. Jim Lewis said of planetary IC lines: "You are centred through the planet's nature". Rising [ASC] lines are seen as curved lines on the A*C*G maps. The lines define an important boundary or meeting place as the earth, in its rotation, continually turns to meet the varied planetary energies in the sky. The earth itself is feeling the planetary force, influence or information arriving along those lines. In personal relocation usage, at the Ascendant lines the force of a planet shows itself thorough direct personal expression. Personality expression and identity become a major focus of interest and activity. A planetary Ascendant line will influence health, energy levels and one's general outlook on life at the given location. In mundane use, a planetary ascending line passing across a country is said to represent the nation as a whole. The force of the planet will influence national characteristics, the myths and the image of the country itself. It can also represent actual physical conditions at that location. Jim Lewis said of Ascendant lines: "here is where you are identified by the planet's nature". Like the ASC lines described above, Descending lines are also seen as curved lines on the A*C*G maps. These lines define an important departing boundary as the earth, in its rotation, continually moves away from the varied planetary energies in the sky. The earth itself is feeling the planetary force, influence or information departing along those lines. In personal relocation usage, Descending [DSC] lines are about partnership. Planets here bring a focus to relationship, both personal and public. They tell us of the influence one has on others, and the quality of the relationships. The force of a planet on the Descending line expresses itself by attracting people and situations according to its nature. In mundane use, such lines over countries could indicate foreign treaties, alliances, wars and related aspects of its national affairs. In both personal and mundane work, there is the possibility of "projection" at these locations. In personal (relocation) studies, the subject may subconsciously attract others to play out projected patterns there, which in turn, challenge the subject to respond. In mundane use, it can indicate where and how a nation will project onto its national enemies those characteristics it finds difficult to see in itself. Jim Lewis adds to this: "difficult planets can be most dangerous here as they tend to draw problems and challenges to you". Mrs Thatcher's terms in office are, among other things, noted for the 1982 Falkland Islands crisis with Argentina. Her handling of this victorious military conflict made her a heroine to the British public. Let's now review the Falklands detail of her A*C*G map. It is notable that Mrs Thatcher's Mars-ASC line is in the battle zone, less than 30 miles from West Falkland (and about 85 miles from Argentina's capital city, Buenos Aries). What does this mean? Mars under any of its lines will give boldness, rashness and a passion that would require caution on the part of an individual relocating to the region. From the mundane perspective, it indicates courage and martial focus would have to be exercised in that region (more so than in other parts of the world) and that the leader or nation would be empowered to respond in kind. Jim Lewis said about Mars-ASC locations: "You look for confrontation and woe to those who affront you under a rising Mars". Mrs Thatcher's Sun-ASC line crosses East Falkland and is less than 25 miles from Port Stanley, its main city and a focus for the fighting. The force of the Sun under any of its lines will stimulate an urge to action, a desire to make things happen and the necessity to become master of one's own fate. In general it is a positive place for an individual (or nation) where there can be leadership, authority and a good plan of action. With the Sun ascending in this region, Mrs Thatcher would embody such characteristics there. Amongst a list of qualities, Jim Lewis said of Sun ASC: "You exhibit leadership, audacity, courage, and a noble demeanour". Margaret Thatcher's birth chart is shown below. Note the "tight" Jupiter opposition Pluto at 14 degrees of Capricorn and Cancer. Because these planets are in opposition, the MC meridian line of one will exactly overlap the IC line of the other. That is, wherever we find the Pluto MC line, we will find the Jupiter IC line conjoining it - and vice versa. When looking at a full map, the identifying labels tell us which planet is on the MC and which is on the IC of the combined line. Review the Falklands detail in Margaret Thatcher's A*C*G map again. Note that the Pluto MC - Jupiter IC line is near to the battle zone. She is, in effect, living out her planetary opposition there, responding to those Pluto-Jupiter planetary forces. Jim Lewis said of this planetary combination: "Circumstances are frequently upset violently, but through such change, you usually advance in position". This confirms what historians point out: the war helped her re-election as she had been losing popularity before the conflict started. Above, it is stated that the Pluto-Jupiter lines are "near" to the battle zone. In fact, those combined lines are 300 miles from Port Stanley. So, what is "near" and what orbs of distance should be used to consider planetary influence? The closer a line to one's location the more one would feel its corresponding planetary influence. It appears that Jim Lewis used various orbs in evaluating A*C*G maps. For some studies he used 300 to 400 miles as maximum distances for effectiveness and at other times distances up to 700 miles (1000 kilometres) were considered by him to be powerful enough to have an effect. In summary, most practitioners feel that orbs depend on so many factors, that it largely boils down to the investigator's personal choice. 'Paran' is a term coined from the Greek Paranatellonta, approximately meaning 'rising together' or 'rising side by side'. It is used in A*C*G to denote a crossing in space between a meridian (MC or IC line) and horizon (rising or setting) line. At this point we literally have a square in space and, as with squares in general, we are likely to be called upon to act or respond to events at these earth locations. The common use of Parans has been opened up to include all crossings on an A*C*G map (such as between one planet's rising line and another planet's setting line). Paran lists are generated by computer programs or can be discerned approximately by eye from the maps. The influence of a Paran is most prominent at the exact point were the A*C*G lines come together over the earth. As an important, though secondary effect, practitioners will note the earth latitude where the crossing occurs and considers the force of those planets active - at that latitude- around the entire globe. Why around the entire globe? Well, in 24 hours the earth will rotate below the crossing of the two planetary lines, energising that entire latitude with the force of the planetary square in space. An orb of plus or minus one degree of latitude is often used when determining the range of potency, though sometimes practitioners enlarge the orb beyond this. As with all of the other A*C*G lines, the tighter the orb, the greater the effect we can expect. Let's consider an example to make this clearer: Mrs Thatcher has a planetary crossing of the Moon on the IC and Saturn descending at latitude 53 degrees South 29 minutes. It is a square of Saturn and the Moon in space, and within a degree of latitude from south Falkland - definitely within the war zone. The crossing (square) itself is some distance away, south of New Zealand and she would experience it most powerfully there. However, we consider the force of her Saturn-Moon crossing to have some effect on the latitude of 53 degrees south around the entire globe. In personal relocation astrology, it would diminish the possibility of her finding a happy vacation destination anywhere on that global latitude. Whatever the main situation might be, she would encounter some problem with relationships along that circle, finding them to be burdensome and without love. In mundane use, locations at 53 degrees South call forth the need for a stern "no" to the demands of others. They would be troublesome places filled with security concerns and responsibilities. A nation might have to deal with long standing disputes at one of these locations, like a recurring family curse. Of course all of this has correspondence with the Falklands dispute, which, like a curse, remains to this day. The mundane A*C*G map for the United Kingdom (shown below) is the one that speaks of the UK as a political entity. The map is drawn for the union of England, Scotland, Wales and Ireland: 1st January 1801 00.00hrs London. In this map the Mars-MC and Sun-Descending lines cross the Falkland Islands. These are the same two planets - though on different angles - that we saw in Mrs Thatcher's chart, which also traversed the Falklands. This shows us that the charts of leaders can activate the potential in national charts. In the UK map Uranus-MC and Mercury-rising cross India. These are the same 2 planetary lines that Mahatma Gandhi had over India on his own A*C*G map! Here, yet again, we note a resonance between a leader and the mundane maps of countries where the leader is active. It is interesting that in Gandhi's case, his Uranus-MC line crossed over the part of India that broke away, becoming Pakistan. Another observation: on the 1801 UK map Uranus-ASC crosses the Republic of Ireland, which was grudgingly under British rule from 1800 to 1922. Northern Ireland remains an area of dissension to this day. Jim Lewis wrote of the difficulties encountered at A*C*G Uranus locations: "Impermanence and constant change must be accepted, along with possible scapegoating, inability to relate emotionally and alienation". A*C*G maps are a relatively new technique in the mundane astrologer's tool kit. Through this introduction I hope to have shown how these maps can give us important information, helpful to our understanding of both political and personal situations. Mundane practitioners also make use of A*C*G maps for the moments of New and Full Moons, eclipses and planetary ingresses (especially the Sun's ingress into Capricorn, which is considered an important predictive tool). Another technique is to examine actual eclipse paths inscribed on A*C*G maps, as they may indicate areas of political sensitivity and possible earthquake-prone zones. Martin Davis is the author of Astrolocality Astrology, (published by The Wessex Astrologer Ltd), widely regarded as the definitive source on Local Space astrology. In the course of his work as an engineer, business consultant and Olympic sportsman, Martin has travelled widely and lived in many different countries. He is a well known lecturer and practitioner in this area of astrology and his energy and enthusiam for its study have encouraged many others to investigate the subject further. Martin presently resides in Scotland and is the Eurpoean representative for Matrix astrological software. Martin is available for astrolocality consultations, lectures, and offers a range of services for personal and business use. Contact him by email for further details.